So we will continue the saga of some family land that is dear to my heart, soul and working body! You have been so helpful on ideas improve some farm land that I inherited. I have spent many hours on this precious land: chasing calves, worming cows, planting bermuda grass, chopping thistles, hauling hay, bush hogging, fencing, and you name it. Hard work but fond memories, and I am so grateful to my Mom and Dad for providing me with a good work ethic, lessons on operating farm equipment, an appreciation for natural resources, an awareness of our dependence on mother nature and God, and some land to call my own. That in itself is quite a blessing. I have taken a few steps to make the land more desirable to wildlife. Now, with your help and shared ideas I want to do more. My land has history, it has character, and over the years the areas have been given names that define each location. I will use this thread to get more of your ideas, post updates of work done, and give some history of each spot, especially how the names came about. OkieKubota and wbpdeer like this. This aerial photo shows the three spots in perspective, and the bordering properties. 1. Pen to hold bulls. Had to be careful during early years of deer hunting. Bulls do not like orange. 2. On our beef cattle farm it was common practice to breed cows all at one time, usually in late January and February so the calves are born in October or November. Bull pen is a remote pasture/wood area secluded from other pastures. Great place to keep the bulls during the “off” season. They build up their stamina, weight and desire. While hunting be careful that they do not mistake you for a young cow. 3. Off season frustration is taken out by fighting each other and “pawing” the ground. Holes dug in the ground resemble a deer scrape except that you could lose a tractor in some of them. Years after bulls are gone, the holes are still there, just covered up now with fescue. 4. hunting . spot where I killed my first good buck, a nice 8 point. Several fairly nice bucks have been taken over the years. Great night photo of one this year. 5. Habitat improvement . Several sawtooth oaks planted in 2004, might be called an oak savannah. Chufa planted for past two years; the turkeys turn into hogs when attacking a chufa patch. Row of pines at road provide some cover but need better screening on the south side of property, which is along the road. 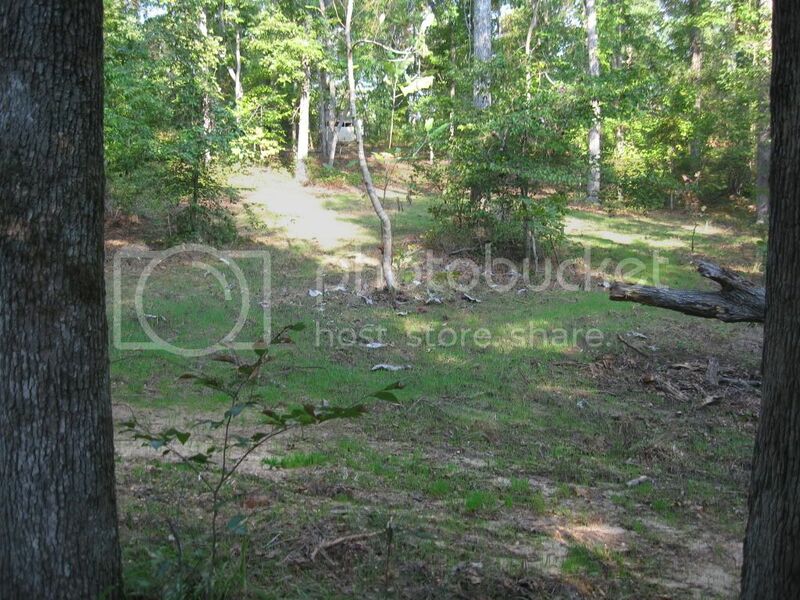 Also, will develop a fairly large food plot in the northwest corner of the woods, and access it from southwest. 1. 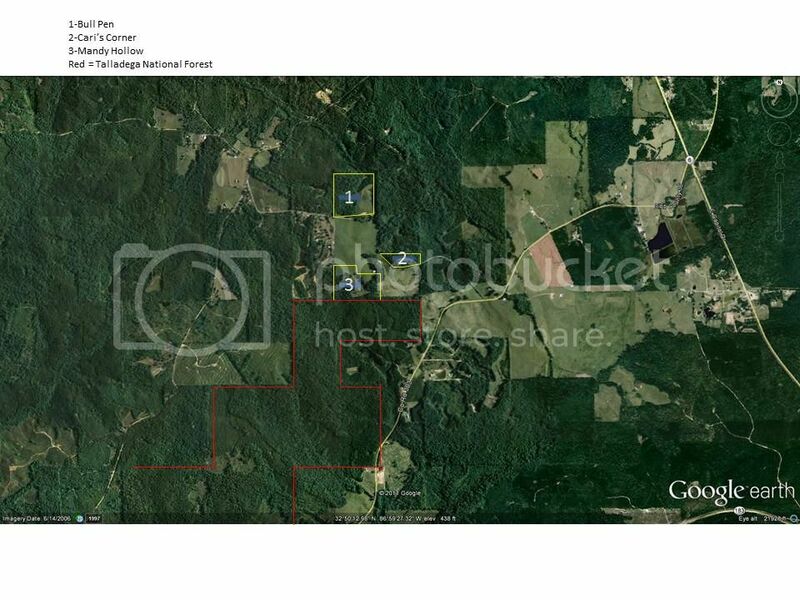 Small 12-13 acre corner plot of woods. Mostly white oak and red oak, large pines were harvested in 2008. 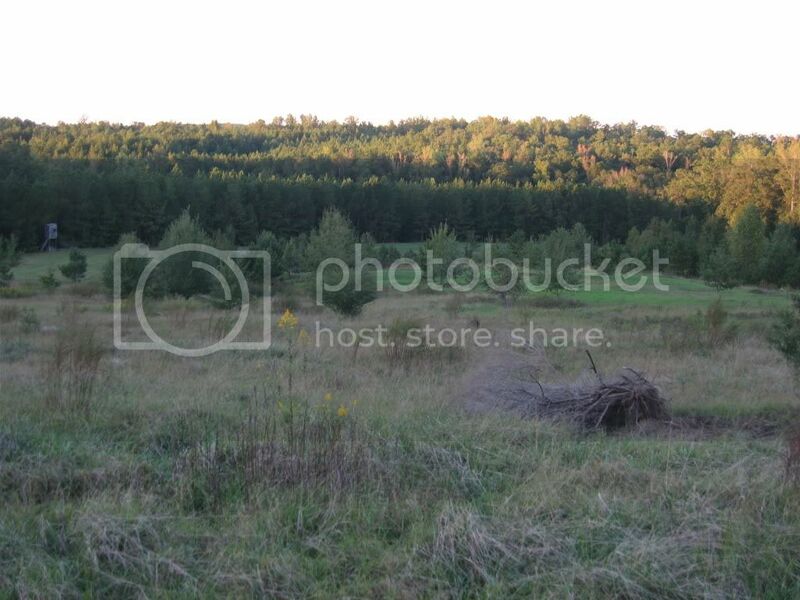 Medium sized open area in center with bow stand and box blind. Plenty of squirrels. 2. When my niece was 10 years old (1986) my brother took her hunting with him one morning, and they went to this spot. He did not have a stand there so he pulled one down from another spot, drug it into the woods, hung it to a tree, and they began to hunt ( only in the 1980’s could you do this). At one point, Cari says to my brother “There’s a deer” And she raised her gun and took a nice 10 pointer. Over the years someone would be going to this area and would describe it as “that plot of woods just at the property line” or “the woods across from the gate”. Well, only when we started calling it “Cari’s Corner” did folks know exactly where we were talking about. 4. Habitat improvement . Oaks are mature and at least some drop acorns every year. Small wet area in center. Need to expand the food plot area, update the bow stand. Not sure if hinge cutting would help area as it is very small and there is thick cover on two sides. 1. Origin unknown. My Mom is working on the history of the name. The hay field next to it is called “Rufus Place” and we know it is named after a guy named Rufus. Not sure who Mandy is, but hope to find out. The spot has never been called anything else. 2. I remember it as all woods and owned by someone else when I was young. The one thing that stands out about it is, when we were working cattle from the catch pen that bordered the property some of calves would jump the fence and run off into these woods. They jumped so high at times that we wondered if perhaps the cows had been bred by the big deer. Later, the property was purchased by my dad, some of it cleared for pasture, and was especially useful in the summer because of continuous spring water in the southwest corner. 3. 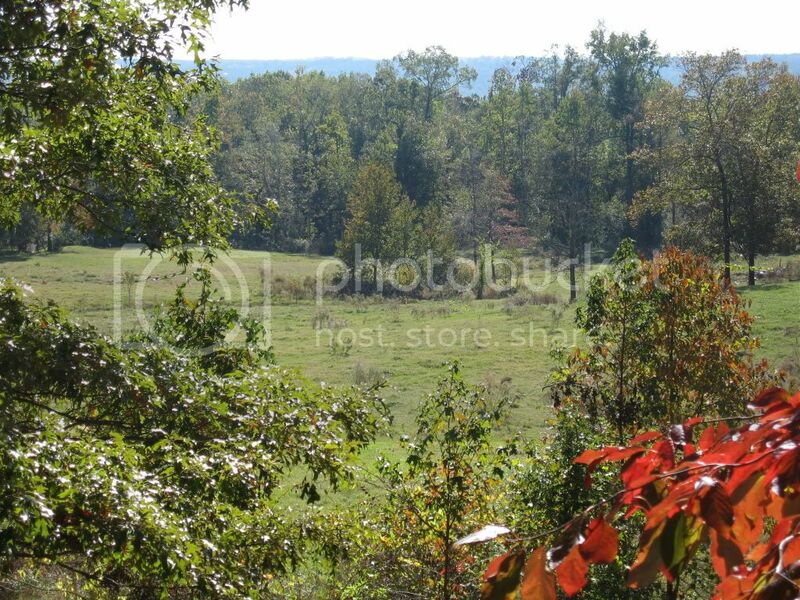 Wooded area includes several oaks, mainly red, and hickory. Persimmon trees scattered around the property. Land to the south is Talladega National Forest. 4. hunting . Has always been a great early bow season spot because of the persimmons. National forest land is thick so good cover to the south. 5. Habitat improvement . Will develop two bow hunting spots, one small food plot near persimmon trees, and medium size food plot in the woods among oaks. Some hinge cutting in the southwest corner to provide some cover on property. Debating switchgrass and/or Egyptian wheat or just make one huge food plot in middle with soy beans, corn, wheat, clover. Familytradition, OkieKubota and Native Hunter like this. I am going to enjoy riding along with you. Any hogs or pigs lately? I thought of your trapping construction when Cutman put on the How to Build Stuff subsection. I got a kick out of seeing the reports and photos. Your land thread is a great read. I encourage others to read it. What a great place and history. Love the unique names of plots. I'm ready for the ride, always good. 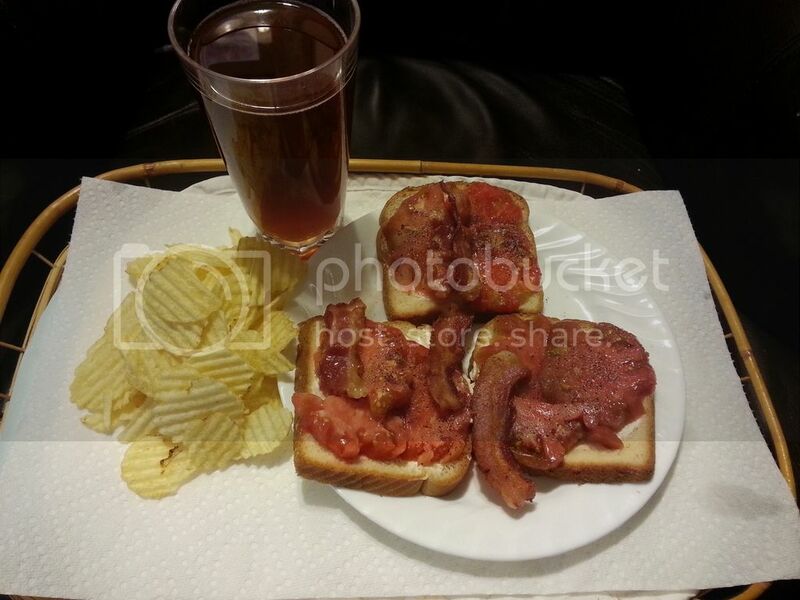 I actually thought that a mater sammich probably should be my first picture on the new thread. I am looking at the qdma version of the tour now and trying to copy the good parts. I don't remember the history lesson so a great refresher. So glad you are here and we all can continue following along. I've told you before but you have some beautiful land. Old friends...The Bull Pen, Carly's Corner and Mandy Hollow. Kinda cool getting to start over on so many of these threads and see how they all started. Glad we all ended up here! Wouldn't be the same without lakngulf. This is the first time I've read your story. Really glad to see you here and I now understand The Bull Pen, Carly's Corner and Mandy Hollow, but where is the Lake and the Gulf? Ha, Fly, you got excited about this picture last year! Flyfixer, Triple C and wbpdeer like this. Lake and Gulf pics are coming. 4 of 9 grandkids will be here at the lake over the next week, so many photo ops. Can you tell me why my mouth is watering? Time to raid the kitchen. The power of suggestion is alive and well on the Lakngulf's thread!!! Looking good / yum yum. 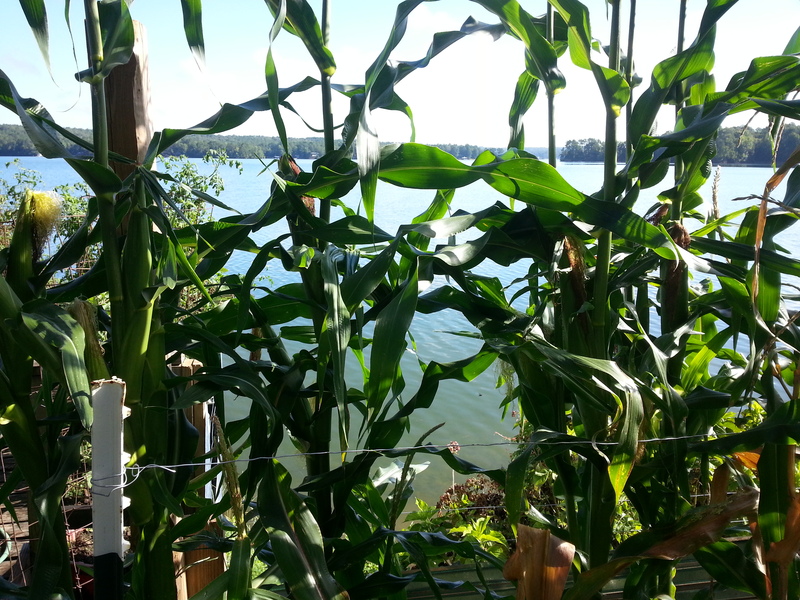 So here is a picture of the lake.......Oh, and I have corn almost ready. Hard to beat fresh corn microwaved in the shuck. Love the names. Great looking property! We have counted the votes and the unofficial results are - You Are the Best Pier Farmer in the Eastern United States. Your prize - give that boy a mater sandwich!! !